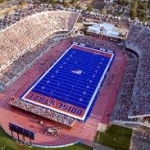 The Colorado State-Boise State game last night and the one played last year in Fort Collins have some similarities. With 11:13 to go in the half, CSU led 28-3 in 2017. Boise St closed the gap at the half to trail 35-17. Last night, Boise State led 28-0 with 10:11 to go in the half and settled for a 35-7 halftime lead. CSU carried the momentum into halftime with a late score and based on the wacky 2017 game, I am sure they felt anything could happen. But, Boise State had a different answer in the 2nd half. The defense provided a key sack by Curtis Weaver to end the first CSU possession, but then gave up a big run and TD to allow CSU to get with 21 points, 35-14. This is where Mike Bobo went for broke and put the game on the line with 6:13 to go in the 3rd. The Rams had scouted Boise State’s kickoff return team and thought they could steal a possession with a popover kick and recovery. It backfired. The special teams magic that Cedrick Wilson had last year in recovering a BSU onside kick was just not there for CSU. It was a more difficult play and they kicked it too far and Boise St easily recovered. When you are playing the best Mountain Division team on the road, you have to take some risk, especially down 3 TD’s. Rypien led Boise State to a TD with a red zone 3rd down scramble and Collingham took a tight end reverse in for a score and that was it for CSU, 42-14. On the next possession, a forced fumble by Avery Williams and recovery put down the Rams for good. CSU loses again to Boise State 56-28. CSU is now 0-8 vs Boise State and that’s one role that will take awhile to reverse. Jeff Caves co-hosts Idaho Sports Talk with Caves & Prater weekdays from 3-6 p.m. on KTIK 93.1 FM The Ticket. He can be found @CavesandPrater (Facebook) and @JeffCaves (Twitter).